As many of you are probably aware, I take commissions for cosplay props. That's a big part of the reason I have a whole separate gallery just for prop photos. I love doing commissions for people because I get a chance to make a lot of things that I wouldn't have a chance to do otherwise, and it gives me a lot of good experience with new materials and ways of approaching different types of props. My most recently finished prop gave me just such an experience. Someone asked me about making a pair of wings, which I've done a few sets before between Tibarn and Kariya, but these particular wings are definitely in a league of their own. 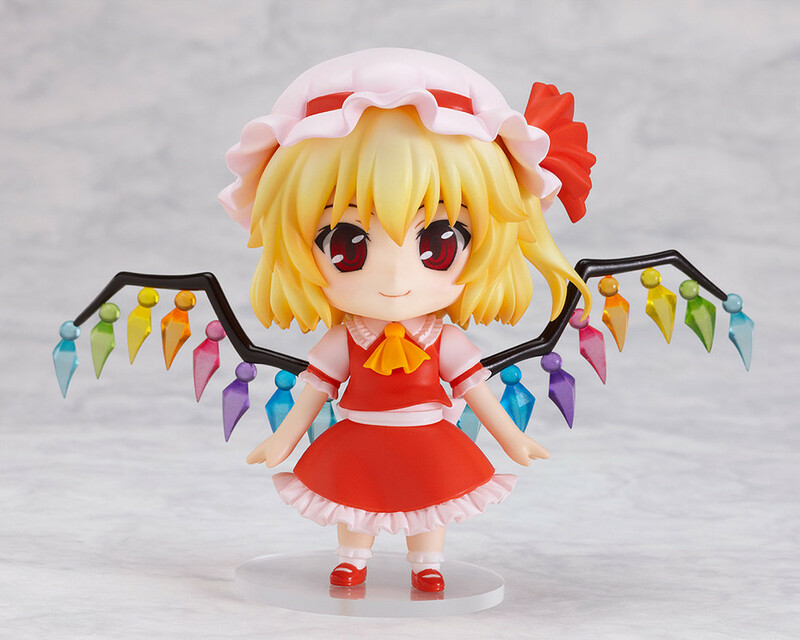 Scarlet Flandres from Touhou project is not a character I'm very familiar with, but I immediately fell in love with the design of her wings... however the task of actually constructing them was a bit more daunting than many of my projects. The first step with any of my props is to figure out what type of materials would be best suited for the project. I knew my client wanted the crystals to light up as well, which provided an added layer of complication. The base of the branch-like wings was fairly simple to decide on: I needed something hollow, sturdy, lightweight, and able to accomodate the shapes that I needed to achieve. The obvious way to go was with PVC, as it fit all of the necessary criteria for this particular project. The next challenge was the lights themselves; I've never incorporated lights into any of my costumes or props before, so I went searching for tutorials online to get some ideas. That's when I discovered Kamui Cosplay. After looking at just a few photos I fell in love with the precision, detail, and all-around gorgeousness of her costumes. And it just so happens she does a lot of tutorials, and even has a few books that she's done. Lucky for me, she has one such book on cosplay lighting! I immediately bought it and and read through it. If any of you out there are trying to light your cosplays, I definitely recommend checking out her Book of Cosplay Lights which is only $5 for an electronic copy; well worth the money! Because this was my first time using lights and I needed quite a few over a fairly wide wingspan, I purchased two strings of battery-powered LED christmas lights rather than trying to wire my own, though I will be wiring some of my own with a few upcoming projects. The last trick was figuring out what to make the crystals out of. My initial thought was using transparency sheets because I needed them to be transparent or translucent and I needed to be able to color them. So, off to Office Max I went. I found that transparencies, while they would probably work fine, were a bit thinner and flimsier that I really wanted, so I ended up getting some translucent poly pocket folders instead... though it was after about an hour wandering around the store grumbling about the fact that none of the multi-packs had a full ROYGBV color scheme (thankfully the store was not too busy so no one else had to deal with my fuming). Eventually I found a pack that had ROGBV, a clear one that looked similar, and a yellow sharpie marker. Voila~ yellow folder! Now, to give the wings a better texture, I decided to paper mache over the PVC. This also let me get them to a sharper point on the end, and make the joints a bit less obvious. Before applying the paper mache, however, it's probably a good idea to put some hot glue on all of the spots where the joints and pipes meet, so they don't wiggle around on you while you're trying to put the paper mache on... again, learn from my frustrations. After it dries I gooped on a few layers of mod podge and painted them! Next comes the construction of the crystals. I worked out a pattern first on some cardstock (I knew geometry class was going to come in handy some day) and fit it all together to make sure my shape worked the way I needed it to. Now that we know the shape will actually fit together properly, it's time to trace it onto my translucent plastic! Once things were traced on, I scored them along the fold lines and glued them together (except for the top part so I could fit my lights in). Once they were all put together, I wrapped each bundle of lights in a kleenex (the tissue helps scatter the light so it's not just intensely bright in the 3 spots where the lights are shining, and it also gives some interesting texture), stuffed it in the crystal, and glued the last few tabs in. The bolts are positioned such that they attach some metal brackets that clamp around the PVC and hold the wings in place. The next, and most important part is adding the straps. The way I did it was by using a D-Ring belt across the midsection and two straps that go over the shoulders and have adjustable loops that the central belt fits through. Most people just make loops that go around your arms for wings, which is ok when they're lightweight, but I find this way to work a lot better because it's more sturdy against your body and it keeps the wings from pitching back while you're wearing them. I developed this method for my Kariya wings because they would always hang back too far when I'd wear them. I intend to change my Tibarn wings too when I get a chance. From this point, it's all a breeze! All that's left to do is add some velcro for the battery boxes, sew a little rectangular pattern with more velcro to cover the back panel, and put it all together! The velcro along the sides is for the fabric panel that covers all of this so you don't see the metal brackets and battery boxes. Now we have a beautiful, glowy pair of wings! I hope this has been enlightening for any of you folks with similar projects. If you have any questions about certain steps I'd be happy to give you more details, just send me a message by clicking on the little envelope in the top right corner! Stay tuned for some more awesome prop creations here at Mikey Does Cosplay, and in the meantime check out the Prop Gallery to see some of the other fun things I've made. Also, if you're interested in commissioning a prop from me, send me a message on here or on my Etsy Store.